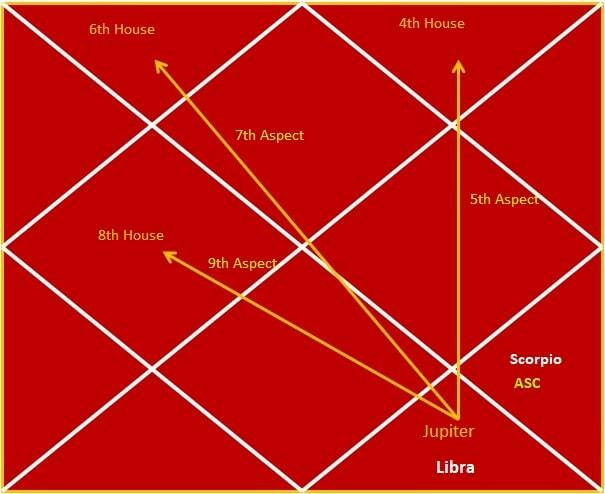 Jupiter transit to Libra 2017 prediction for Scorpio Sign - Guru peyarchi palangal 2017 for Vrischika Rasi as per Thirukanitha Panchangam. Let us analyze Guru Peyarchi 2017 prediction in detail for Vrischika Rasi, so we can know what to expect. The Scorpio is the 8th constellation seen in the zodiac chart. The stars or Nakshatras Vishakam (padham 4), Anusham and Kettai come under the Scorpio constellation. The people born under any of these stars have Scorpio as their moon sign. The Scorpios possess a thinking leaning towards spiritual and devotional thoughts. Their will power will see them through the toughest of paths, once they decide to achieve something. Lord Mars is their ruler. Lord Jupiter rules the monetary and 5th House for you and is a friendly planet to your moon sign. Last year on August 2, 2016, Lord Jupiter transited to the House of Virgo and is currently placed there. This year, He transits to the House of Libra on September 2, 2017 and stays there till October 4, 2018. Last year’s Guru peyarchi brought you good luck and progress. Students were able to score well. People at work received promotions and increased wages. Those expecting marriages and childbirths had their wishes turned to reality. Court cases were won in your favour. Long standing loans were repaid to you. Thus last year was a good year for you. Let us look how the Guru payarchi this year will affect you. This change will bring in a mixture of both good and bad occurrences to you this year. Lord Jupiter transits to your 12th House (House of Libra, House of expenditure). This does not bring in the desired results for you. You can see your expenses increasing. But it is up to you to curb useless expenses and spending them wisely. This way, you can repay your debts. Lord Jupiter aspects your 4th House (House of Aquarius) with His 5th part gaze. The 4th House is concerned with your properties like houses, lands and vehicles and also your maternal side. Your mother’s health will improve. Your interest will turn towards buying new properties, houses and constructing new buildings. Also, Lord Jupiter aspects your 8th House (House of Gemini) with His 9th part gaze. The 8th House is the House of longevity and Mangalya sthana for women. Any dangers to your life will vanish. For women, the strength of their mangalya sthana increases. Students will face a rocky year ahead, with their scores climbing up and down. Your health will not be affected much. Those in professional jobs will see obstacles hurled in front of their promotions and salary hikes. Joyous occasions will ring in cheer in your family. You will buy new houses, properties and vehicles. Marriage will take place after facing some hurdles. You will plan for new ventures. Your trips to faraway places will bring on added expenditure.